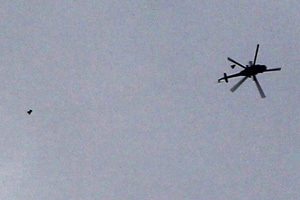 A Syrian government forces helicopter drops what activists said are two barrel bombs over an area of Aleppo on February 2, 2014. Photo: Aleppo Media Center. Indeed, Bashar al-Assad’s military forces are responsible for the slaughter of over one hundred and seventy thousand Syrian civilians, the maiming of at least a million others, and the imprisonment and dislocation – between internally displaced persons and refugees in neighboring countries – of close to ten million others. Proportionally speaking, this would respectively correspond to close to 1.5 million, 14 million, and 140 million Americans if the atrocities in Syria were to be perpetrated in the United States. And yet the Syrian killing machine keeps on doing what it does best, while the Syrian President gloats that he is fighting terror and denying access to terrorists in the service of humankind. Meanwhile ISIS controls large swaths of territory in Syria and Iraq and Islamic State jihadists, mismanagement, and brutality have systematically destroyed the lives of millions in both countries in the name of creating an imagined Islamic Caliphate. Since June 2014, ISIS has been responsible for the killing and imprisonment of thousands of Sunni and Shia Muslims, Yazidis, Kurds, Christians, and others. It has exiled tens of thousands from their homes, sold women into slavery, imposed harsh social codes in its areas of control, buried people alive, and brutally executed local and foreign journalists and aid workers. One can imagine how much worse its toll of human suffering would be were it to possess the assets presently owned and deployed by the Syrian regime. In fact, aside from magnitude, ISIS and its supposed adversary in Damascus can reasonably be considered two sides of the same coin and thus should be treated as the pariahs that they are. 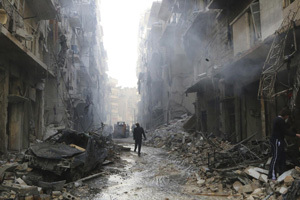 The international community is in a quandary as to how to deal with the two faces of brutality in Syria. Rightly, regional and international efforts are today devoted to rolling back ISIS’s advance, destroying its assets, and drying up its funding sources – all for the purpose of ridding the Levant of the group’s millennial extremism and infrastructure. Other localized efforts in neighboring and other countries are being devoted to depriving the organization of support and sustenance, although such a task will likely be longer-term than expected since the conditions for the rise of ISIS-like or ISIS-affiliated groups are not being addressed adequately. Yemen and Libya have adherents to ISIS’s ideology and practices; Nigerian Boko Haram has just pledged allegiance to ISIS; while others, like Tunisia, Lebanon, Turkey, and Central Asian countries cannot stop believers from joining it on the battlefields in Iraq and Syria. It is in the objective of stopping the Syrian regime’s atrocities that the international community has resoundingly and most assuredly failed. It is in the objective of stopping the Syrian regime’s atrocities that the international community has resoundingly and most assuredly failed. Indeed, many international actors are almost resigned to the prospect of letting President Assad continue in his position as his country slowly implodes. Staffan de Mistura, the United Nations envoy to Syria, has since the summer of 2014 been hard at work trying to arrange ceasefire agreements between the Syrian regime and opposition forces, with the city of Aleppo as a testing ground. But recently he opined that no solution to Syria’s crisis can be achieved without Assad’s participation; a statement interpreted by the latter to mean his staying in office, the Geneva I consensus and its stipulations be damned. In other words, let the storekeeper who set fire to the store also be in charge of extinguishing it. Poignantly, one wonders if de Mistura has entertained the real possibility that Assad will use whatever ceasefire agreement he and his colleagues may be able to achieve in one city to augment his forces in another in order for him to continue to wreak the same havoc on his people from one place to the next. The Obama Administration has long retreated from any positions implying sanctioning Assad, flatly stated that it has no strategy for Syria, and delayed training and equipping Syrian moderates to help ease Assad out of power. For reasons related to domestic American considerations, President Obama’s proposed legislation regarding war authorization limits American involvement to fighting ISIS, mostly from the air. At this juncture there seems to be no fathoming of a prospect in which American forces might go beyond targeting ISIS positions and assets in Syria. Instead, the long-term de facto strategy of the United States appears to avoid any commitment to rid Syria of Assad short of beginning to train opposition fighters; and that, for the time being, is for the purpose of helping to fight the Islamic State. 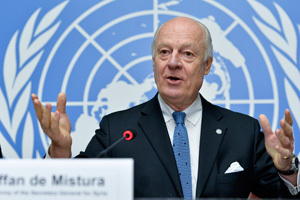 Staffan de Mistura, United Nations Special Envoy for Syria, speaks in Geneva, Switzerland in January 2015. Photo: United Nations. The European Union stance regarding Assad cannot be measurably seen to differ much from the American. France, the United Kingdom, Belgium, and others have sent air assets to help in the international coalition’s operations over Syria and Iraq, but they have equally avoided targeting Syrian forces. Only the countries of the Gulf Cooperation Council have declared that regime change in Damascus is as important a goal for their foreign policies as defeating ISIS, and their active support for the Syrian opposition and participation against the Islamic State group are clear examples of their commitment to both goals. As for Russia and Iran, not much can be expected in this regard since Assad represents an ally whose services will remain invaluable. Both have given the Assad regime the material, political, and international support he needs to stay in power. Both mouth the necessary platitudes about the loss of Syrian lives and the need for political solutions but simultaneously supply Syria’s army with the materiel that has destroyed the lives of millions. In the Islamic Republic of Iran’s case, it has directly sent the Lebanese Hezbollah, Iraqi Shiite militias, Shiite recruits from South Asia, and active-service members of its Revolutionary Guards to the Syrian battlefields. To both Russia and Iran ISIS remains the only menace that needs to be faced and defeated. 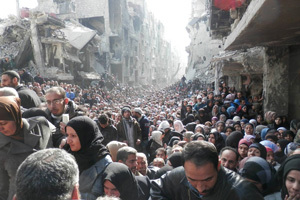 The besieged Palestinian camp of Yarmouk queuing to receive the first humanitarian supplies after six months of siege, in Damascus, Syria, in January 2014. According to the United Nations High Commissioner for Refugees over 3 million people have fled Syria to Turkey, Lebanon, Jordan and Iraq, while 6.5 million people are internally displaced within Syria. Photo: UNRWA. Unfortunately, the atrocities perpetrated against the Syrian people by the Syrian regime and the Islamic State group are not new happenings to the horrible world of war. Equally daunting is the unfortunate likelihood that they may not be the last. Human history has witnessed vagaries of war at scales both lower and higher than the Syrian case. All such barbarities found cynical justification by their perpetrators, ranging from racist supremacy to ethnic conflict and cleansing to quelling rebellions to fighting terrorism to defending the homeland to spreading the word of God. The international community long ago arrived at a standard focusing on the sanctity of human life, especially that of civilian non-combatants. International statutes and conventions for the protection of civil rights, for the prevention of crimes against humanity, and for the defense of the defenseless have been codified and ratified. What has been lacking has been an equal application of these statutes and conventions, a failure that sullies the moral fabric of the international community, its peacemaking and peacekeeping organizations, and its leaders. If the world of nations, and especially those that have the power to enforce what is right, fair, and just, and prevent and/or reverse that which is wrong, unfair, and unjust – in other words, to do good – fails to move purposefully and quickly, it is not difficult to foresee what is likely to happen and not happen. If such leaders fail to do the necessary to help alleviate the suffering of the Syrian people at the hands of the Syrian regime, on one hand, and ISIS, on the other, it is difficult to fathom how an international order of peace, security, and justice can be established, let alone buttressed and maintained not only for posterity but tragically, also, for today, tomorrow, and the day after. Dr. Imad Kamel Harb is a Distinguished International Affairs Fellow with the National Council on U.S.-Arab Relations, a non-profit, non-governmental, educational organization in Washington, DC. This entry was posted in Imad Harb, ISIS, Syria and tagged World.